As more systems become PROV-enabled, there will be a corresponding increase in the need to communicate provenance data directly to users. 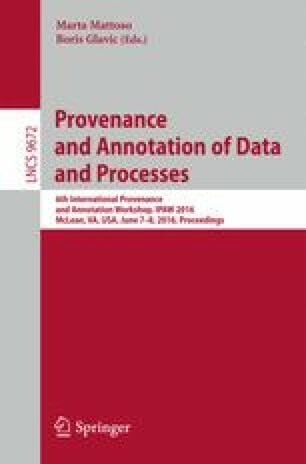 Whilst there are a number of existing methods for doing this — formally, diagrammatically, and textually — there are currently no application-generic techniques for generating linguistic explanations of provenance. The principal reason for this is that a certain amount of linguistic information is required to transform a provenance graph — such as in PROV — into a textual explanation, and if this information is not available as an annotation, this transformation is presently not possible. In this paper, we describe how we have adapted the common ‘consensus’ architecture from the field of natural language generation to achieve this graph transformation, resulting in the novel PROVglish architecture. We then present an approach to garnering the necessary linguistic information from a PROV dataset, which involves exploiting the linguistic information informally encoded in the URIs denoting provenance resources. We finish by detailing an evaluation undertaken to assess the effectiveness of this approach to lexicalisation, demonstrating a significant improvement in terms of fluency, comprehensibility, and grammatical correctness. Research was sponsored by US Army Research laboratory and the UK Ministry of Defence and was accomplished under Agreement Number W911NF-06-3-0001. The views and conclusions contained in this document are those of the authors and should not be interpreted as representing the official policies, either expressed or implied, of the US Army Research Laboratory, the U.S. Government, the UK Ministry of Defence, or the UK Government. The US and UK Governments are authorised to reproduce and distribute reprints for Government purposes notwithstanding any copyright notation hereon. The investigations and human experiment were subject to ethics approvals ERGO-FPSE-16722 and ERGO-FPSE-16731, and the source data used to generate the sentence pairs was drawn from the Southampton Provenance Store (https://provenance.ecs.soton.ac.uk/store). The research data can be found at http://dx.doi.org/10.5258/SOTON/393255 and http://dx.doi.org/10.5258/SOTON/393257.